Though many of our tomatoes are done for the season, our late-planted Matt’s Wild Cherry tomato plants are still going strong. Many of our other late-planted tomatoes – especially cherry tomatoes – are still producing. 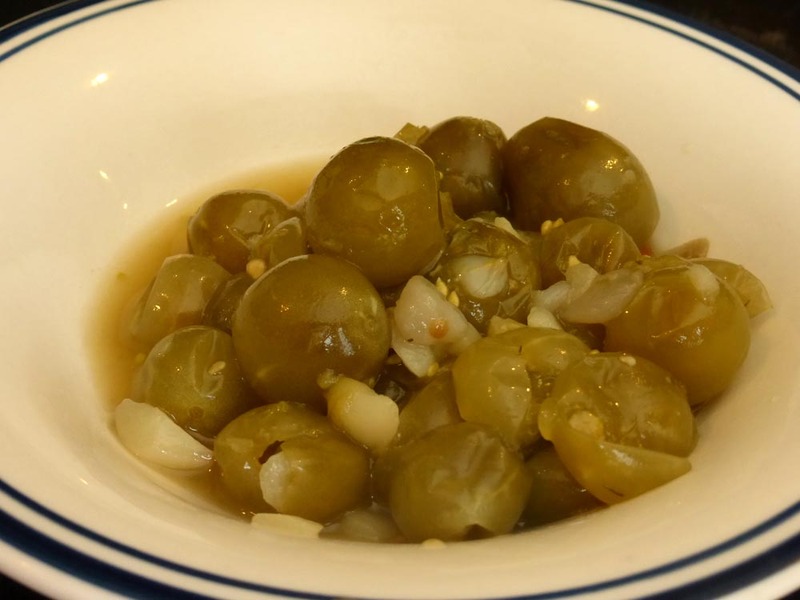 It might be the ideal time to ferment a batch of green cherry tomatoes. 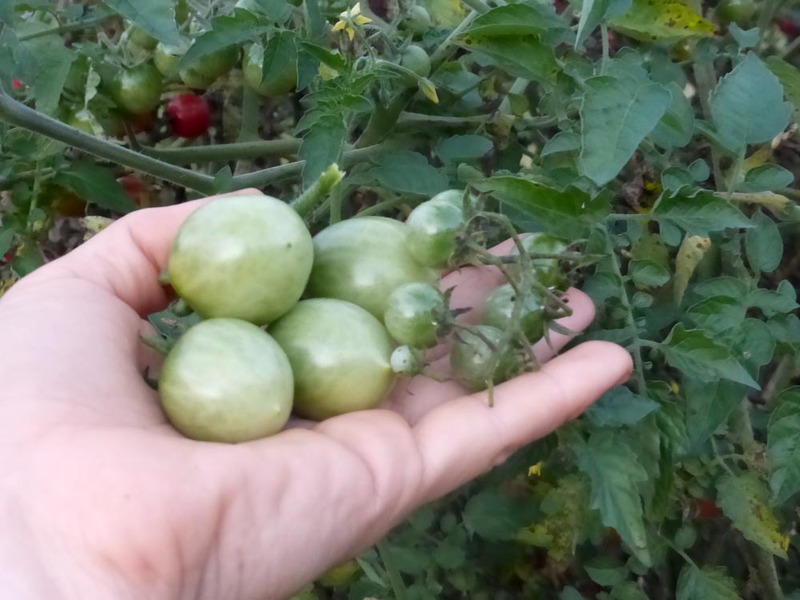 We still have green cherry tomatoes that we lacto-fermented in the summer of 2012, when we were aggressively rouging out off-types of Amy’s Apricot tomato because it had cross-pollinated in our trial patch two years before. But fermented green tomatoes are so delicious, even when softer than the way we like them most, that we probably don’t have enough to last us through the winter. Really, they can taste incredibly similar, though of course not identical, to green olives. Here’s our recipe, scaled down for family use: Wash and de-stem about a gallon of green cherry tomatoes that are at least half of full size. Throw in a handful of peeled garlic cloves, a couple hot peppers, and a heaping spoonful each of coriander, dill seed, and dill leaf. Cover with a brine made of about 8 tablespoons of salt and 8 cups of water, and then with a weight to hold the tomatoes under the water. (A food-grade plastic bag half-full of brine can make a good weight.) Tie a cloth over the top of the container to keep flies out, and let it sit at room temperature until the tomatoes are as soft as olives. Then put replace the cloth with a lid and put it in the fridge for long-term storage and eating. As with other lacto-fermentation, as long as you don’t forget the salt, the rest of the choice of ingredients is up to you. For example, feel free to add lots of hot peppers or none of them. Feel free to add onions, sweet peppers, your favorite spices, etc.